Hantel hTY A858/Q5 and other models. Since there isn't a dedicated forum section or thread for Hantel phones. I am creating this thread to assist others in garnering more info about Hantel mobile phones. The Hantel phones are actually good quality phones, they are not cheap Chinese clones. Believe me, I bought 2 of those Sciphone i68+ for my brother and sister, both are decent phones but they have terrible reception and though they may look like an iPhone they only can run Java apps and the OS is clunky and hard to navagate :D . My Hantel on the other hand has very good reception (actually better than my Motorola Ming), it has a good quality 2 MP camera, the LCD and touch screen is excellent, and has Windows Mobile 6.1(apps out the wazzu!) :( . 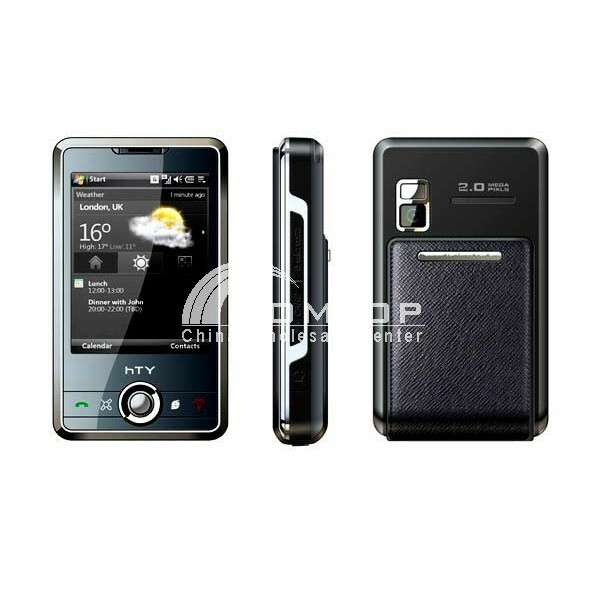 1)Though it may say Elf 0100 under the battery, the hTY Q5 is no HTC Touch. They have the same Texas Instruments ARM 926T processor and OMAP 1030 chipset, but they are not the same phone. The mainboards are similar in shape but the components are in different locations. Believe me, an ELF ROM will not work, I have tried it and took forever to find the info and the program to revive my Q5. 2)Different versions of the same model. The first version of the Q5 had the ILI LCD screen and the newer version has the LG LCD screen. To find out which LCD your phone has, simply type in **168## on your Myphone Keypad. This will launch the HCIT Test Program, here you can get info on your phone's ROM Version and test the controls, LEDs and LCD screen. Select 1:Phone Info, this should give you a string of numbers and letters similar to this Q5_LEN_WM6.1_V3.00_091216_LG28_OV2_HY76_HTF_ND_BT_ WF_G. Write them down and keep for future referance. Notice in the middle of the string (_LG28_) this is the LCD version. The older version will be have (_ILIxx_). The reason you need to know which LCD verion that your phone has, the ROM that you may intend to flash must have the correct LCD screen drivers. If you flash a LG LCD ROM onto a phone with the ILI LCD, your LCD will no long turn on at boot up. But this can be easily remedied by flashing the correct ROM using the proceedures in the next step. 3)Flashing a new ROM .img: This is a straight forward proceedure, you simply place the file uploader.img into the /root of you SD TFlash card. Turn off phone, insert TFlash, press and hold the select button(middle navigation button), then press the power button. A white screen will appear with Chinese characters which roughly translate to "Updating ROM"
Allow phone to complete the flash process and the phone will reboot with the new ROM image. ***Do not flash with any ROM images from the Chinese forums, all are in Chinese and most don't even have an English keyboard. All the Chinese ROMs that claim to be WM 6.5 are just 6.1 with a fake shell. *** I'm investigating into the hTY 3232, if it has the same mainboard as the 858 / Q5. If so we may have a source for an English ROM. Stand by! 4)There is a ROM Kitchen that will work with the hTY ROMs, it's called Scoter's Kitchen. I haven't downloaded it yet. I saw it in one of the treads on a the http://forum.chinafonini.it forum. I've been reading up on the proceedures necessary to dump the ROM. I will provide links to info on other forums as I locate them or at least congregate them all into on file sharing server. 5)So far most all the apps that I have tried work flawlessly. But there are always exceptions. I will also post any apps that will cause trouble. Well that's all for now, but here are some links to help you on your way to modding Hantel. Feel free to contribute and also inform me if any info I have posted is incorrect. Thanks. HTF = Unknown (Possibly indicates Frequencies of Quad-band or Tri-band. It is very rare to find Hantel users in most English speaeking forums from what I have seen. Technically they are a very cheap HTC Windows Mobile clone they are designed more for the Asian markets. I've never seen one of these devices in the high street stores but they always appear on Ebay. It's good to know that the phone is working well for you as it is one of those devices that make you wonder how good they really are for the price.